U.S. govt. 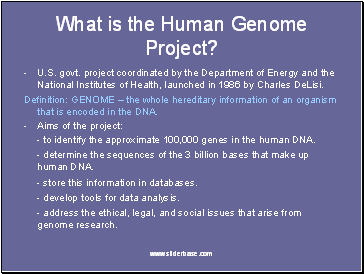 project coordinated by the Department of Energy and the National Institutes of Health, launched in 1986 by Charles DeLisi. Definition: GENOME – the whole hereditary information of an organism that is encoded in the DNA. - to identify the approximate 100,000 genes in the human DNA. 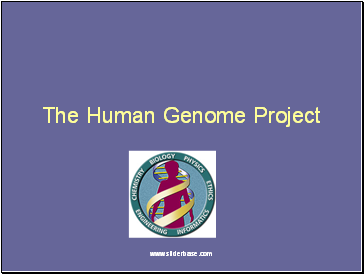 - determine the sequences of the 3 billion bases that make up human DNA. - store this information in databases. - develop tools for data analysis. 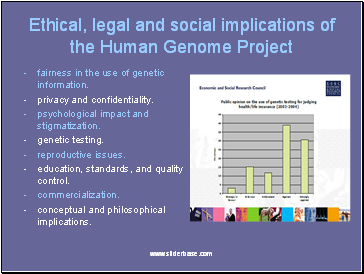 - address the ethical, legal, and social issues that arise from genome research. Whose genome is being sequenced? 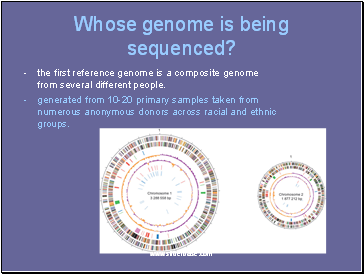 the first reference genome is a composite genome from several different people. generated from 10-20 primary samples taken from numerous anonymous donors across racial and ethnic groups. - microbial genome research for fuel and environmental cleanup. - improved agriculture and livestock. - better understanding of evolution and human migration. - more accurate risk assessment. 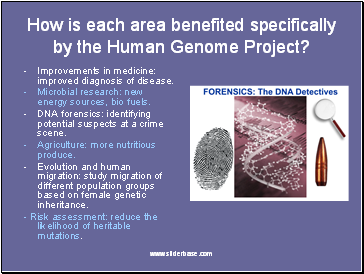 How is each area benefited specifically by the Human Genome Project? Improvements in medicine: improved diagnosis of disease. Microbial research: new energy sources, bio fuels. DNA forensics: identifying potential suspects at a crime scene. Evolution and human migration: study migration of different population groups based on female genetic inheritance. - Risk assessment: reduce the likelihood of heritable mutations. fairness in the use of genetic information. education, standards, and quality control. 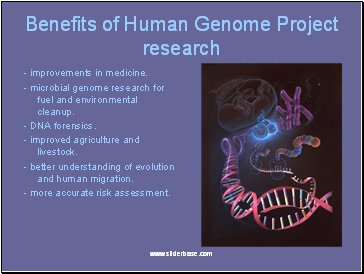 What are the implications of the Human Genome Project specifically to each of these areas? Fairness and privacy: who should have access to your genetic information? Psychological stigmatization: how does knowing your predisposition to disease affect an individual?